Three years ago, expectations for Rise of the Planet of the Apes were understandably low. The director (Rupert Wyatt) wasn't well-known, a lot of people despised the film's star (James Franco) for his Renaissance Man routine, and we all remembered how terrible Tim Burton's 2001 Planet of the Apes reboot was. Plus, Fox held off on screening this new movie until the Tuesday before it came out—rarely a sign of confidence. But none of that mattered: Rise was one of the pleasant surprises of the summer of 2011, an ambitious, emotional character drama with more soul and smarts than the typical blockbuster. Now comes Dawn of the Planet of the Apes, which isn't just better than its predecessor, but significantly so. Emotion, soul, and smarts are still part of the package, but this sequel is also darker and more despairing, without merely being a spiritual copycat of The Dark Knight, like so many summer movies these days. Dawn is somber and exciting simultaneously—grown up in its themes but thrilling in an old-fashioned, big-screen kind of way. It's bracingly, thoughtfully moral in its attitudes about war without comprising those attitudes when it comes time to deliver the big action set pieces. It has its flaws, but they're at the service of trying to do something grand and stirring. And it may finally convince you that Andy Serkis isn't just an expert motion-capture performer, but a legitimate, superb actor. The film takes place about 10 years after Rise; the simian flu alluded to in that film's end credits has wiped out much of the human population, and the genetically enhanced apes (led by Caesar, who's played by Serkis) now rule a forest kingdom right outside San Francisco. 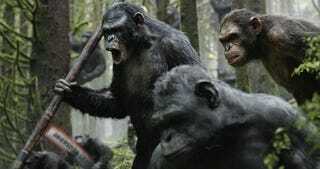 There are important human characters here, but director Matt Reeves (Cloverfield, Let Me In) crucially starts his movie by focusing on the apes: not just Caesar, but also the hair-trigger Koba (Toby Kebbell), who like Caesar was imprisoned by humans, and Caesar's son Blue Eyes (Nick Thurston), who looks up to his father but lacks his patience. Communicating mostly through sign language—they can talk, but only in rudimentary sentences—the apes have become accustomed to a world without humans, which none of them seems to mind, except for Caesar, who harbors fond memories of Franco's kindly scientist, now presumed dead. Dawn's long preamble with the apes isn't an accident: One of the many great things about this film is that humans aren't really the main characters. This doesn't make them the bad guys, though. The screenplay (credited to Mark Bomback, Rick Jaffa, and Amanda Silver) does an excellent job of making neither side of this looming conflict our rooting interest. Much like its predecessor, Dawn gets a lot of its moral nuance from a belief that opposing sides don't have black-and-white differences, but shared interests that put them at odds. And although those differences may be minute, they're important enough potentially to cause great bloodshed. When humans do arrive in the form of Jason Clarke's compassionate father Malcolm and Keri Russell's admittedly underdeveloped doctor Ellie, there's an immediate tension between the two sides, and it never lets up over the next two hours. Humans may have guns, but they're outnumbered by apes, who are physically far more powerful and ferocious. The apes may be less sophisticated, but the humans are more desperate. (Gary Oldman's Dreyfus, the humans' militaristic leader, has tried to rally the survivors in San Francisco with an eye toward obliterating the apes.) Despite the mutual distrust, though, Malcolm meets with Caesar to make a suggestion: The humans need to repair a power-generating dam in the ape-controlled forest so that the survivors will have energy. If Caesar agrees to this truce, Malcolm and his team will get in and get out as quickly as possible, never bothering the apes again. Otherwise, Malcolm fears the survivors may be tempted to attack the apes, setting in motion a war that neither side wants. It's probably not a surprise that this proposed truce doesn't work out. (The movie isn't called That Time That the Apes and the Humans Agreed to Share the Planet in Peace.) But Dawn's considerable power comes from our thin hope that maybe, just maybe, cooler heads will prevail. It's a testament to the film that not only do we feel justified in holding onto that hope, we eventually understand why a truce can't last. When all hell finally breaks loose in Dawn, the resulting carnage is horrifying and cathartic, but it's grounded in a recognition of our best and worst traits—our capacity for optimism and goodness married to our suspicion of outsiders and our weakness for lashing out with violence as a first resort. What makes that acknowledgement sting is that the filmmakers force us to see ourselves in both sides' position. Neither group is perfect—and, regrettably, Dawn does make it a bit easy to guess which character from each side is going to be the real troublemaker—but the movie isn't interested in sides as much as it is in valuing reasonableness. Malcolm and Caesar don't have much in common except for good intentions, but with their people inching closer to war, good intentions may be the only way to prevent a catastrophe. And since we don't cheer for one side over the other, we sit back and see the frustrating complexity of all ethnic or regional conflict. Remarkably, Dawn might be the first post-apocalyptic summer blockbuster of the post-9/11 era that doesn't consciously evoke 9/11 memories. Instead, the movie seems to be commenting on the fractious divisions that are cable-news constants—specifically, between Israel and Palestine. If people (and apes) are united by the same desires—safety, love, freedom—why can't peace flourish? Why can't we all get along? Dawn explains why with incredible intelligence. Past betrayals lead to new suspicions. The good deeds of many are undermined by the thoughtlessness of an irrational few. Fear trumps common sense. I'm not explaining much of Dawn's plot because its intricacies matter and are best experienced without any spoilers: Rarely has a big studio movie been this attuned to the machinations of so many characters, each individual's emotional arc important to the overall impact. If Dawn isn't filled with showstopping performances, it's because the movie doesn't require such grandstanding. What's needed is a hard-edged, almost weary kind of believability, and that's what the cast provides. Clarke exudes such empathy as Malcolm, a man desperately trying not just to maintain the truce but, perhaps, to prove to himself and Caesar that humans aren't as bad as their worst impulses would suggest. And Russell, Oldman, and (as Malcolm's son) Kodi Smit-McPhee are all plausibly scarred by a decade of sadness and rampant death: Their characters' tired eyes suggest the misery they've absorbed and don't ever want to discuss again. But the real standout is Serkis. For years, there's been discussion about whether the mo-cap performer (perhaps still best known for playing Gollum in The Lord of the Rings) was deserving of an Oscar nomination, a debate that highlighted the Academy's inability to ever nominate an actor based on a technology-assisted or animated performance. The effects work in Dawn is very nearly flawless, but Serkis provides the film's heart. For as much of a multi-character drama as Dawn is, the movie is really seen through Caesar's eyes as he continues to wrestle with his affection for some humans, while at the same time trying to protect his own kind. Serkis is stoic, but also principled and worried, the weight of the apes' future heavy on his shoulders. It's a performance that made me think about some of the leaders and American presidents I most admire: the ones who have faced difficult circumstances with intelligence, perseverance, and a faith in our better natures. Dawn of the Planet of the Apes sometimes falls victim to clichéd supporting characters and overly familiar post-apocalyptic conventions. But those liabilities help put into sharp focus just how much of this movie is right. The reason why critics slag studio blockbusters is because they so often feel made by committees—they're dumbed-down because they want to appeal to as many viewers as possible. Dawn doesn't do that. It respects you as a viewer and figures you're bright enough to understand what's going on under the surface. As for Reeves, this is the film that firmly establishes his credentials as one of our best mainstream filmmakers. If Cloverfield was an excellent example of turning the found-footage gimmick into something truly thrilling, and Let Me In was a wonderfully moody remake of the Swedish vampire flick Let the Right One In, this film is the work of a consummate professional wielding his talent on a big canvas. He handles the intimate character moments beautifully, but he's just as gifted with the third-act battle scenes. (There's a 360-degree shot on top of a tank that's simply bravura.) Most Hollywood movies give us a clear delineation between good and evil. This one won't. We're too invested in both groups, mourning a future that could have easily turned out better if only things had worked out a little differently. A lot of summer blockbusters help us escape the realities of the world. This one has something to say about them.